From past years United Arab Emirates (UAE), has garnered immense popularity among the investors all over the globe. Dubai always welcomes foreign investments greatly with most liberal restrictions as the country is with continuous economic growth and stability. If you are an investor, than Dubai government can offer you different types of business models for efficient sale generation, such as direct sale, commercial agency arrangements, branch or representative office, Limited Liability Company and Special free zone investments. You can also directly buy or sell a business in Dubai without having to go through any bureaucratic hurdles prevalent in other countries. As far as starting a new business in Dubai is considered there are some things which can’t be omitted. Let us guide you towards major considerations so that it wouldn’t be a hassle for you to grasp what it’s like to conduct business setup in UAE. if you are planning your business future in Dubai, first and foremost get your business license done. Your Business License is issued through verification by the Department of Economic Development (DED), which will enable you to commence your business operation in the country. It is required in the UAE for foreigners to have a local partner before they can start a business set up in UAE in the non-free zone areas of the State. This sponsor must be a UAE national and will be given 51% of the shares, therefore he will be able to call all the shots regarding the business. There will be also a yearly payment to the sponsors that will be negotiated by both parties. It is advisable that a good rapport should be established between the two parties so that they can aid each other and there will be least problems in the midst of formation or after doing so. When it comes to location selection, you must have a good knowledge of the region. Be prepared to undertake extensive research into the business sector you aim to operate with. It is very important to find a suitable place for your company to set up a business in UAE. You should choose that place which is close to your target customers. While selecting the location always keep in mind, “where your business is most feasible at. “It is your product and service which is going to decide your location. Don’t rush into the place just because you feel comfortable, your business should be profitable in it. If you wish to have 100% ownership on your business, it is good if you set your company in a free zone area. Besides this each free zone has its own list of advantages. However, it is not necessary that free zone can prove beneficial to all business, for example, if you are planning for a retail store in UAE it is better for you to be in mainland rather than selecting free zone. Choose wisely your agent as he can help you to sort all the fuss that comes with the business setup in Dubai. Consultant/ agents will walk you through a step-by-step process, ensuring that you are aware of what’s happening. These agents usually have contacts with government and all the authorities in the UAE, which will help you in setting your business. After giving your business responsibilities to these agents you only have to sit and wait for the best results. When the business is registered, you must show the Ministry of Commerce that you have a substantial sum of money to invest. The required sum varies between the states (it’s between $10,000/£6,500 and $50,000/£33,500 in most cases) and is regarded as a guarantee against liabilities, although you may withdraw the money shortly afterwards. In order to start your business, you must be aware that the process is complex and financially risky, meaning that local knowledge is crucial. You must also consult a good lawyer from the outset. An experienced lawyer will guide you through the registration complexities and his help will be vital in protecting your interests. 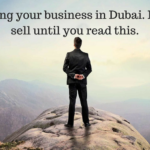 NEXT Next post: Planning to sell your business in Dubai? Don’t sell until you read this.